Hidden Valley is a serene haven of relaxation. Set in a beautiful valley with sites overlooking the tranquil waters of the Avonmore River and a glassy, private lake, we offer the opportunity to experience a holiday amid an abundance of wildlife including kingfishers, cranes, wild geese, ducks, otters and pheasant. We are easily accessible from Dublin, Dun Laoghaire and Rosslare ferry ports. Bookings for Caravan and Camping are made online – sites are first come, first served. Advance booking is essential for weekends, high season and bank holidays. There is no minimum stay for touring/camping, except for Bank Holiday weekends (3 night minimum). Full contact details with deposit are required at time of booking: full payment required for stays up to 2 nights and 2 nights or full payment required for longer stays. For couples looking to book, please note that in July/August and on bank holiday weekends the park is very busy with families with young children. River Valley Park in Redcross has an “adult only” area if interested. ALL families are charged a €50 refundable noise deposit on arrival by credit/debit card. We are a family, friendly site and we do not tolerate late night disturbances. Don’t book our park if you think you’re going to stay up late. Check-in available from 12 noon and checkout is by 12 noon on day of departure. Dogs are allowed touring & camping as long as they are kept on a short lead and supervised by an adult at all times. Should you need to cancel or change your dates for any reason, we will give a full refund, or change your dates, with a minimum of 7 days notice. We regret to inform you that campfires are no longer allowed at Hidden Valley. This past season we noticed far too often the number of people being negligent in regards to fire safety. Customers may still bring charcoal BBQ’s (no timber burning is permitted). Read our Terms & Conditions before you Check Availability. The park offers both hard-standing and grass sites, each with electric, water and grey waste. We also have a tent only area with electric. The modern toilet and shower block is heated and tiled, and also includes a laundry room and camper’s kitchen overlooking the Avonmore river. Bookings begin in October each year for the following season. Example: 1 caravan with 2 adults and 2 children with electric is €42.00 per night in mid season. Free onsite children’s activities include fishing and the kid’s outdoor adventure park – embankment slide, two large playgrounds, giant space net and football pitch. €20 per child: includes unlimited use of playgrounds and includes 4 activities (choose between kayaking, bumper boats, paddle boats, mini golf, bungee trampolines, rock wall, archery and water balls). €10 per adult: includes 2 activities (choose between kayaking, bumper boats, paddle boats, mini golf and archery). Please note archery is not available on all days, and not all activities are available during low season. Visiting hours are from 10 a.m. to 5 p.m.
7 nights for the price of 6 when paid in full at time of booking (not available in July and August). Modern, heated toilet and shower block. Each shower cubicle has a bench and hooks for hanging your clothes and towel. Hairdryers are not provided, but electric points are provided in the shower block for your own hairdryer and razor. Laundry room with washer/dryer facilities and a large washing sink. Washing powder is available for sale in reception. Campers Kitchen with washing-up sinks, hot and cold water and electric hobs for cooking. Disposable BBQs are available from reception. Pets are welcome camping as long as they are kept on a lead at all times and minded by an adult at all times. We do not allow pets inside any of our accommodations. If you book an electric pitch, then you need to supply your own camping lead. 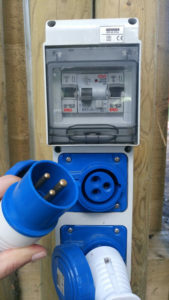 Your camping lead needs to have a round blue 3-pin plug on one end that connects into our electric bollard as shown. This camping lead is standard throughout Europe. If you haven’t bought your camping lead yet, then we recommend buying a camping lead that is at least 25m long (this is plenty long for pitches on our park, however other parks may need longer). We do not sell camping leads, so please see your nearest camping shop. Are you fed up towing your caravan back and forth all summer long? If so, then a seasonal site might be just for you. These sites are available from mid March to the end of September. With a seasonal site you are welcome to come and go as you please all summer long. No more calling, no more bookings and no more fighting the holiday traffic. A home away from home… it can’t get any easier than this! Please call for rates. Monthly sites are available for all months. 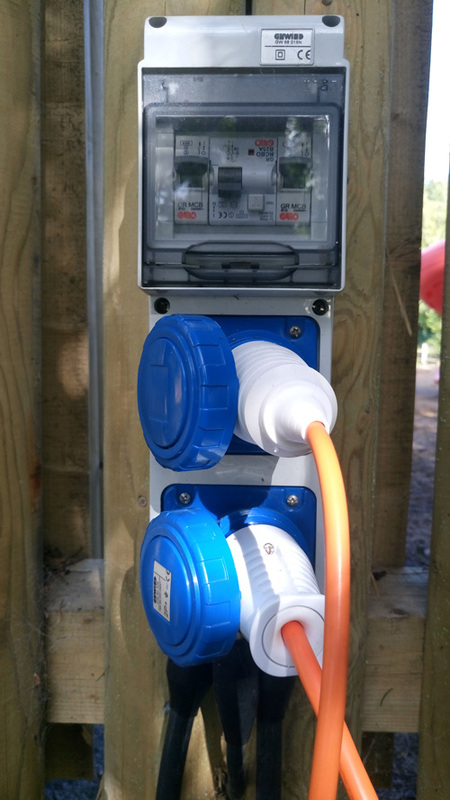 All sites have electric, water and waste hookup. Electricity is 10 amps. Please call for rates. Availability is limited. Rallies are welcome all season long. Discounts will be given to rallies at all times and an extra discount will be given during our off-peak season (April, May and September). An eclectic mix of pubs, restaurants and shops are all within walking distance from the park and excursions to Dublin and Wexford are easily managed with both the train and bus just minutes away.Our team is more than happy to book activities for the group including team-building exercises located on the park and run by our staff, a night of dinner and dancing in the local town or excursions to nearby towns and places of interest.